Upton Tea Imports was the first tea seller from which I ordered teas. I used to read the catalogues front to back. It was a pleasure to see the packages on my stoop. I placed orders with the company between 2007 and 2009, at least according to my blog records. I didn't stop ordering from Upton for any particular reason, certainly not because of a poor experience with their teas. I was delighted to hear from them this year. I chose two teas, New Zealand Gordonton Estate Oolong and Tindharia Estate First Flush FTGFOP1 (EX-1) Organic Darjeeling, both of which I review here, and received a gift of Pre-Chingming Silver Sprout Green Tea. I chose the oolong and Darjeeling for specific reasons. I did not drink enough first flush Darjeelings last year. I told myself if I was given the opportunity to drink a first flush this year, I should take it. Upton Tea Imports offers many first flushes so it was a difficult to choose only one but in the end, the Tindharia was most appealing. As for the oolong, I wanted to drink an oolong with which I had little experience. I had drunk only drunk a New Zealand rolled oolong one other time to my knowledge. Each tea was prepared per the instructions provided by Upton Tea Imports. The parameters for the oolong are 1t/6oz/3m/190F and for the Darjeeling are 1t/6oz/3m/212F. 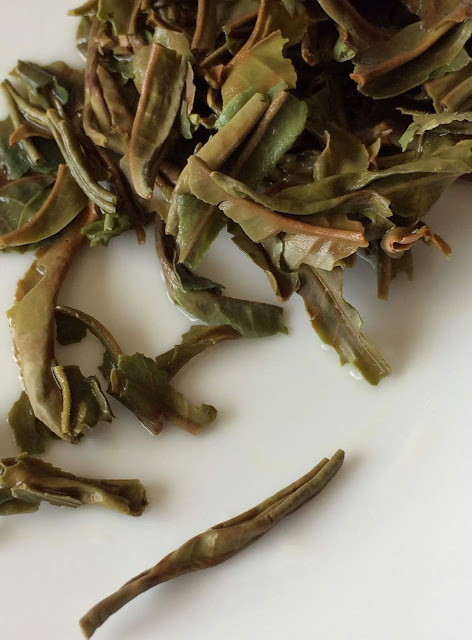 Before steeping this oolong, I worried that 1 teaspoon wouldn't yield a flavorful cup of tea. The first infusion was light in color and in the flavor: pale yellow with a slight butteriness and a hint of flowers. The dried leaves had promising scents so I steeped a second cup using the same tea leaves and 195F water for 4 minutes. The tea had an improved body with olive oil taste and texture. There were floral notes mid tongue and everything lingered. There was a subtle roast flavor when aerated. As the tea cooled, I detected a slight dryness and a cherry tartness on the roof of my mouth. The dry leaves of this Darjeeling smelled herbaceous, sweet, floral, and woody. When rinsed, a stone-fruit pit bitterness wafted from the teapot. The light brown liquor yielded herbaceous notes first followed by maple candy sweetness. Both lingered. The medium-bodied tea had a pleasant astringency layered with apricot jam on the roof of my mouth. The maple note declined as the tea cooled but the liquor was still sweet and left a slight hairiness at the back of my throat. I infused the leaves a second time and although the cup was less intense, it had more balance among the flavors. Use more leaves when infusing the oolong. Also, consider a higher water temperature. I was happy with the Darjeeling, but keep a close eye on the steep time. The Darjeeling my favorite of the two teas. Finally, I would encourage tea companies to provide steeping parameters for Western and non-western infusion styles. The New Zealand Oolong and Tindharia First Flush Darjeeling were provided by Upton Tea Imports. Wonderful tea review and it makes me want to crack open my Darjeeling teas to compare. It's as if I could taste the teas you reviewed, thank you and wonderful job! Gabie, thank you for your generous comment! I am kind of an oolong enthusiast myself but never tried this one. But I will in the future!